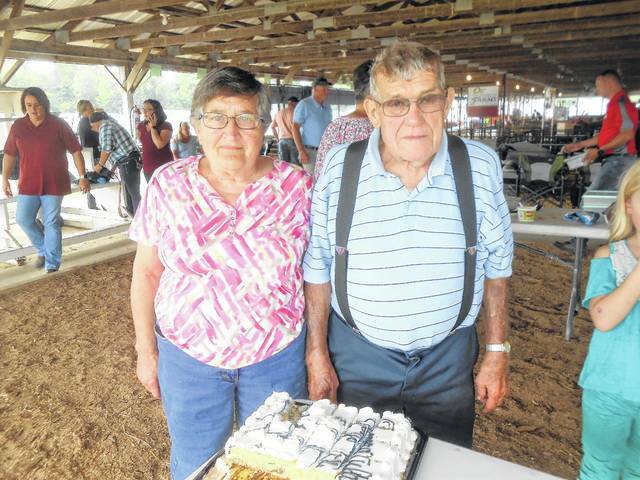 MOUNT GILEAD — Glenn and Joan High were honored at the Morrow County Fair for 50 years showing sheep and lambs. Morrow County Sheep Growers celebrated with a congratulatory cake and a display of pictures and memorabilia at the Lamb Barbeque Thursday. “It was a real surprise to see the display they made for us,” said Joan. Joan said they were also recognized at the Ohio State Fair last month for showing sheep and lambs for 50 consecutive years. Glenn had shown sheep since he was a youth in FFA, beginning in 1951. The Highs give credit to Dale and Tom Huvler for starting them on the circuit where they showed at fairs around the state. Sheep and lambs are a tradition for the Highs’ children as well. They showed sheep for many years at the Morrow County Fair and Roger and David now raise sheep as well. Their son, Roger is Sheep Extension Specialist for the State of Ohio and also raises Dorsets. David is a high school science teacher in Scioto County and raises Shropshires. Their daughter Wanda lives in Upper Arlington and Joan says her girls are active in 4-H and travel to their sons for their sheep projects. The Highs have fewer sheep than they did in past years, but they still have sheep and lambs and enjoy eating lamb. Glenn used a special recipe with a mustard sauce for the lamb barbecue this year. Highs said they got the idea for the lamb barbecue from the Delaware County Fair. They’re not sure of the exact date they started the Thursday Lamb Barbecue at the Morrow County Fair. Glenn estimated that it’s been about 45 years, beginning about 1972. The Highs and other families who raise sheep, follow a long tradition of raising sheep in Morrow County. The 1880 History of Morrow County states that sheep were introduced in 1811. By 1879 sheep were numbered at 116,974 in Morrow County at a value of $260,101. Cardington was named for the “carding machine”, used for carding or combing wool. It was the first industry in the village. Mike Galleher gave special thanks to Hoffman Meats for providing the lamb for the lunch at cost. He thanked Glenn High and Dale Davis for carving the lamb and sponsors who include: Barth Burgett family, Cloyd Huvler, Guy Flora, Mid-States Auto & Salvage-Mark and Melissa Phillips, Morrow County Sheep Improvement Assoc. and Pioneer Seed-Carlyle Smith. Cory Conant and Lexi Hinkle show sheep. https://www.morrowcountysentinel.com/wp-content/uploads/sites/29/2017/09/web1_SheepShowmanship-1.jpgCory Conant and Lexi Hinkle show sheep. Joan and Glenn High were honored for 50 years showing sheep at the Ohio State Fairs and Morrow County Fair. They were also instrumental in starting the traditional Lamb BBQ at the Morrow County Fair for the past 40-plus years. https://www.morrowcountysentinel.com/wp-content/uploads/sites/29/2017/09/web1_DSCN2093-2-1-1.jpgJoan and Glenn High were honored for 50 years showing sheep at the Ohio State Fairs and Morrow County Fair. They were also instrumental in starting the traditional Lamb BBQ at the Morrow County Fair for the past 40-plus years.